Undhiyu – With Love to my Darling Mother! First it was my father-in-law’s closely guarded secret – Yusuf’s Kate Masale ka Gosht. This time it is my mother’s secret recipe that I have tried to re-create here. I cooked this for lunch and well, it came close to her brilliance!!! The missing ingredient was perhaps a mother’s love! This recipe is a tribute to the selfless caring and unconditional love that will need many lifetimes to partly reciprocate. 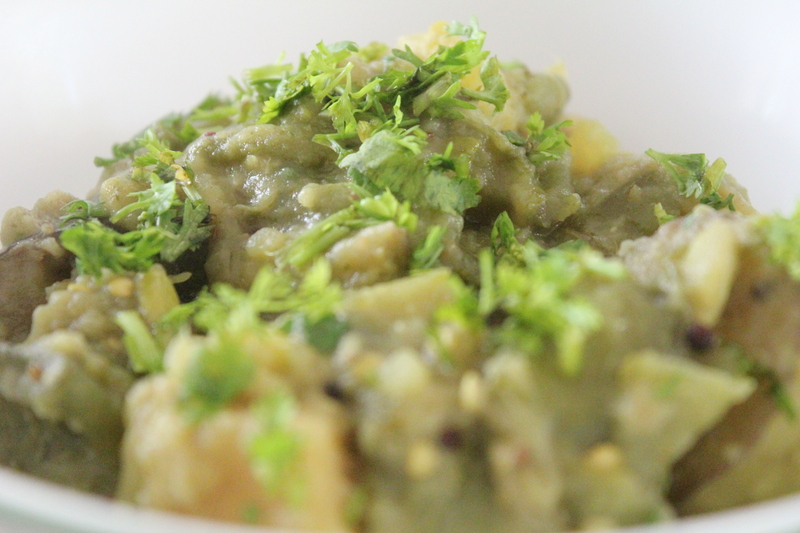 This is a recipe that is found in most gujarati thalis or gujarati weddings. The version here is much lighter and less sweeter than most gujarati homes. If you wish to replicate the sweet gujarati flavor add more oil and a greater quantity of sugar! Some of the ingredients are usually seasonal (particularly the flat beans (papdi) and yam (kand). 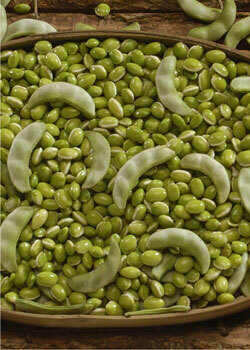 These can be replaced with a different variety of yam and similar beans. The authentic recipe also features fresh garlic (kachcha lehsun) but for the sake of convenience I have used regular garlic cloves. If you do find fresh garlic make sure you reduce the quantity as it can get very, very strong! Make a rough paste of garlic, green chillies, ginger and half the coriander leaves. Mix all the muthiya ingredients except oil and prepare a firm dough. Divide the dough into small portions and shape each into rolls, and deep fry in hot oil. Remove and keep aside. When mustard seeds crackle mix in ground masala (step 1) and all the vegetables except the beans. Mix well. Cover and cook this for around 5-7 minutes. Put the the beans in this. Add turmeric, asafoetida and salt. Stir fry for five minutes on high flame. Pour a cup of water, cover and simmer on a very low heat for 15-20 minutes or until the yam is totally cooked. Add the fried muthiyas and sugar/pounded jaggery. Simmer for 15 minutes shaking occasionally. Serve hot with bajra ‘rotlas’ or phoolkas laced generously with hot ghee! 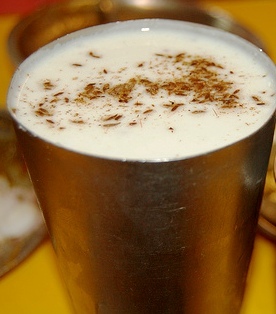 Cold Chaas (buttermilk) with freshly roasted, ground cumin and salt is a great accompaniment with this meal. 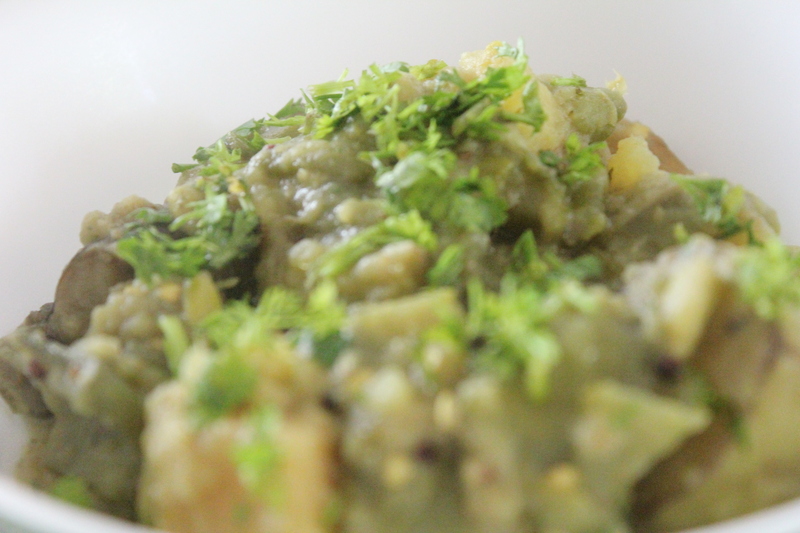 To make it even more rustic take some fried green chillies and lumps of jaggery with this meal. It is recommended that you schedule a siesta after this meal as you are sure to feel drowsy after a sumptuous gujju meal!